My son turns 16 next week. He is just a few years shy of this age. So I genuinely wanted to know his thoughts on the subject. 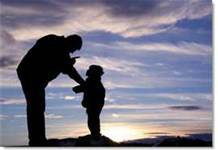 I explained to my son that none of us are above falling into sin, or are we immune from straying from the fellowship. But I assured him that should that happen in his life that he would always be loved and prayed for. It was comforting to know that my teenage son had a clear understanding of part of the ministry of the local fellowship. He understood that if he were to stray from God (and then the church as a result) that his brothers and sisters in Christ would be there to hold him accountable. Regardless of what some will say today, exhortation is a biblical principle. It is detrimental to a person’s spiritual growth to be removed from the fellowship of the local church. Yet, many enthusiastically walk away. When this happens in a young person’s life and they fall into sin, it’s good to know that their parents will always be there. But how much more powerful is it knowing that a whole group of others who love you is there as well – bearing your burdens, lifting you up in prayer, holding you accountable, admonishing you when you sin, and rebuking you in love. A church that truly loves each other will exhort one another. We do it because we love. We do it because it pleases God. We do it because if we don’t, sin will harden our hearts.